If you’re carrying around an exposed circuit board and a bunch of wires people are going to notice you. But a dry erase marker won’t turn any heads. And this one holds its own little secret. It acts as a master key for hotel room door locks. This is really more of a repackaging hack. The exploit is already quite well-known. The Onity brand of key card locks most commonly used in hotels have a power jack on the bottom that doubles as a 1-wire communications port. The first published proof of concept used an Arduino board and a simple adapter to unlock any door in under one second. Now that hardware has been reduced in size so that it fits in the hollow shell of a dry erase marker. Even better, the felt tip has been replaced with the appropriately sized barrel jack. Check out the ultra-fast and inconspicuous use of it after the break. We think using this is no more obvious than actually having the key card. 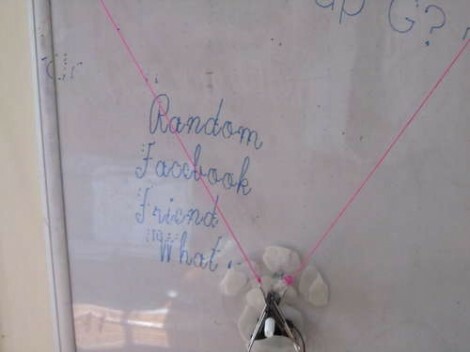 [Dave’s] drawbot writes his Facebook wall messages on a whiteboard. The setup is pretty simple, depending on a pair of stepper motors and common household goods. As you can see in the image, the stylus is a plain old dry-erase marker held by a big spring clip (the kind that holds a stack of papers together). What you can’t see is that there’s a kick stand to hold the writing head away from the board when moving to the next plot point. In this example a cursive font is being used, but [Dave] included two other fonts in the code. Those require the felt tip to be frequently lifted from the board, and a servo motor does this by pressing a cotton swab against the surface. This does erase any marker lines it slides past, but it’s a pretty small area that is lost. To control the motors [Dave] is using the EiBotBoard which was originally designed for the EggBot. It’s got a USB mini-b connector which lets a computer push messages scraped from the Internet. Don’t miss the video demonstration embedded after the break. A small modification would make this into a pretty nifty light painting rig. This clock has a robotic twist to it. It will show you the time by drawing it in dry-erase marker. There’s a bit of play in the arm joints and some loose motor precision which results in a wavy font that prompted [Ekaggrat] to name his project the Doodle Clock. The shape and building material used here really make the timepiece look great. We think if the arm holding the acrylic writing surface had been at right angles this would not look nearly as pleasing. The video after the break shows the bot in action, at first flexing its wrist to switch back and forth between marker and eraser. From there it starts to draw the time, tracing the segments of each digit multiple times to achieve a readable number. 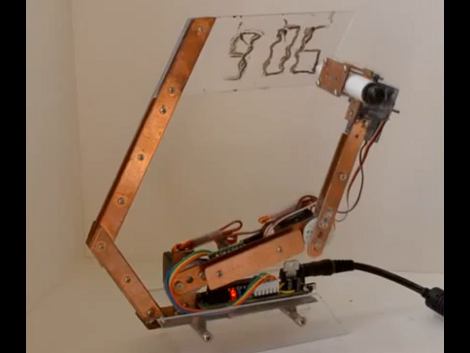 The entire thing is driven by an Arduino compatible board mounted on the base of the clock. This reminds us of that felt-tipped Turing Machine. A variation on that would also make a really nice clock display. We love all of the creative Halloween costumes that have started trickling in now that the holiday is finally over, and people have found time to document their last minute projects. Take this functional Etch A Sketch costume made by [mazinbenny]. The knobs are lawnmower wheels. The pulley system is strung with 1/16″ wire rope to move a carrier for a dry erase marker. The marker draws directly on an acrylic screen. HowStuffWorks has a post on how a real aluminum powder based Etch A Sketch works. We’ve covered more technical Etch A Sketch projects in the past. We’ve seen them hooked up to computer mice, drawing portraits at Maker Faire, and commenters have even suggested turning mechanical dry erase boards into giant Etch A Sketches.